On Second Scoop: Ice Cream Reviews: Would you try "ice cream" made with hemp or flax? Would you try "ice cream" made with hemp or flax? The freezer aisles are pretty quiet right now so let's keep the discussions rolling instead. Today's question: would you try an "ice cream" made with any combination of hemp or flax? 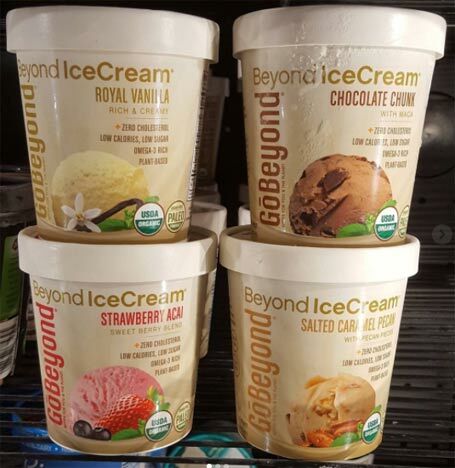 Formerly known as Omega Creamery, GoBeyond Foods out of California has managed to make it all the way over to my east coast Wegman's freezer aisle. They're throwing around lots of buzz words like grain-free Paleo, organic, omega-3s, super foods, probiotics, non-dairy, cholesterol-free, non-gmo, low calorie, low glycemic and plant based (so Vegan?). Yup, don't think they missed any. It's made with "flax-hemp cream" which is a mix of water, flax oil, hempseeds, sesame oil and sunflower lecithin. They also use their special "BeyondSugar" blend which unfortunately includes my old nemesis: stevia. So I won't be trying these, but maybe someone out there has already tried it or will start looking for it. The flavor lineup includes Chocolate Chunk, Hemp Date Nut, Strawberry Acai, Royal Vanilla, Mango Lassi, Dark Chocolate, Cappuccino Chip and Salted Caramel Pecan. Their instagram feed also shows a Passion Hibiscus Sorbet but it's not on their website. I guess the most important question is about how good (or bad) will the texture be. Six years ago I tried Tempt hemp milk frozen dessert and the texture was pretty terrible... which might explain why they don't make it anymore (though Tempt is still around). So, would you try it? Sure. Why not. I don't have issues with any of the ingredients. I don't have much faith that they could possibly taste good. But I can't believe I'd find them more disagreeable than I find Arctic Zero. I'd try it just for kicks. Not only would I try it, I'd be willing to pay $6.00+ for it! Too many of the non-dairy options on the market nowadays are just full of sugar and unnecessary fillers. I think that it would be nice to have a tasty AND healthy option in the freezer aisle for us dairy-intolerant folks. LOL, no they missed "gluten free" and "vegan". Grain-free and Paleo is practically redundant. I agree that all sounds so tryhard. That being said, some dairy-intolerant people cannot have soy or treenuts or coconut, so that part is commendable. If the hemp/flax blend was only 80/20 instead of 50/50, it might be okay. Flax on the other hand, tastes like grass. Not cannabis grass...But "post-lawn mowing smell in the air" grass. Then again, it has flax oil, not ground up flax, so it might be okay. Every now and then I want a non-dairy dessert (So Delicious is my go-to for that) so I may try vanilla out of curiosity. But my expectations would be low. I'd probably end up buying some almond milk and making shakes out of it because these flavors are just so boring. Seriously, I don't like these flavors in actual ice cream. You say non-dairy options are "just full of sugar" but uuuuh we're talking about ice cream alternatives here! Isn't that kind of the point? The dairy-intolerant were tired of being left out of the enjoyment of ice cream because of the DAIRY, not sugar? 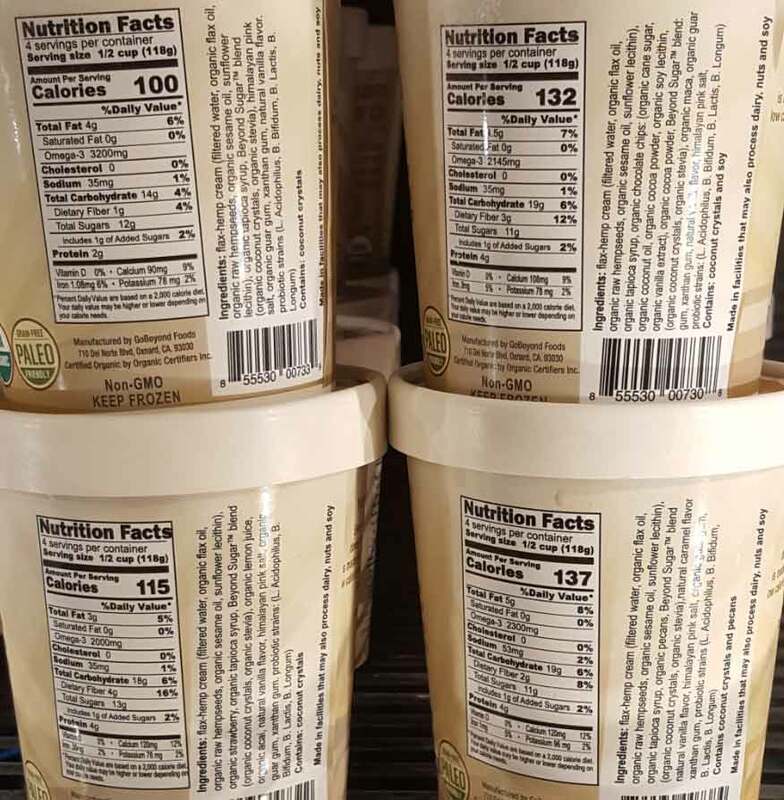 I just looked at my pint of "So Delicious Coconut Cookie Dough" and one serving has 19 grams of sugar. Most dairy ice creams of that flavor contain 25-28 grams, and 19 grams of sugar is also in 2 servings of strawberries. How low in sugar does a "dessert" need to be? Plus "sunflower lecithin" and "flax oil" sound like fillers to me. So Delicious is a hit because it contains enough sugar and calories to be rich and creamy despite no dairy. 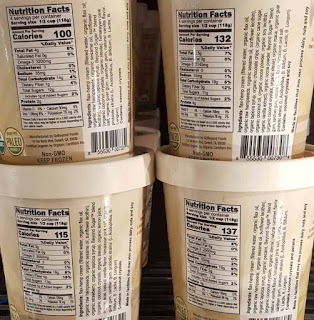 Halo Top is a hit because even though it's low calorie and sweetened with stevia and erythitol, there is still SOME raw cane sugar in there, and real milk and eggs. But this stuff sounds like it's taking away *everything* that makes any dessert good. Might as well just eat some berries for dessert. Berries are vegan, gluten-free, all-natural, paleo, low glycemic, low calorie, all natural AND they actually taste good. Maybe if they could nail the texture right. @Anon#2: technically it says "plant based" too so I corrected the post. That's the same a vegan right? @Aleksandr: yeah, texture and no weird taste/aftertaste are the big ones. I eat Wink Frozen Desserts...not ice cream, but mostly with some SF chocolate syrup when I'm counting calories (note: it is not a comparison with ice cream!!). It has flaxseed, and that has absolutely no bearing on whether or not I'll eat it. Honestly, for me, if they started advertising that as a major benefit, I'd probably stop eating it. :) I tend to get alienated by trends, though. I used to like pumpkin, but have over the last few years have developed an instinct to run from anything pumpkin-flavored! I've tried Good Karma's Flax Milk in a vanilla flavor & really enjoy it. I prefer it over almond & cashew milk. I agree with Anonymous, Wink has no comparison AT ALL with ice cream. I had it once, gagged, and found myself wishing I had a pint of Arctic Zero instead (which to be fair, Arctic Zero's new chunky peanut butter pint is actually pretty darn tasty compared to literally every other frozen ice flavor they've sold). Wink was the most vile thing I've ever tasted and I'd rather eat a pint of Ben & Jerry's and run for two days straight burning off those calories. Therefore, sure, I'll take one of each - they can't be worse than Wink! I wouldn't expect it to be anything like ice cream, but hey if it turns out good then all the more reason to celebrate. I love Enlightened and Halo Top ice cream pints and eat them daily, so if it was really that bad I'd be able to sleep at night knowing I washed it down with a back up I had on hand.